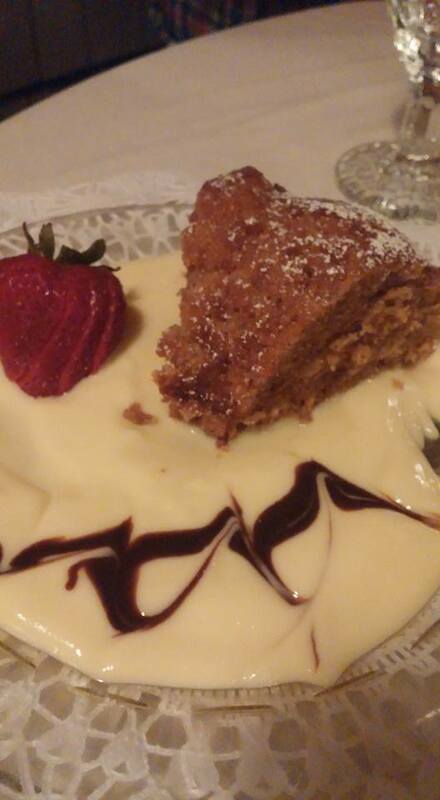 The Clipper Inn Restaurant in Clayton has long had a reputation as one of the more sophisticated fine dining establishments in the Thousand Islands. I first ate there in college, on a date, and reveled in what I then considered the height of haute cuisine: a glass of white zinfandel and chicken Parmesan. Because it’s not right on the water, though, sometimes I forget about this special place for dinner. So when I sampled the restaurant’s excellent oatmeal cake at the Taste of the Town event earlier this year in Watertown, I added it to my to-do list. 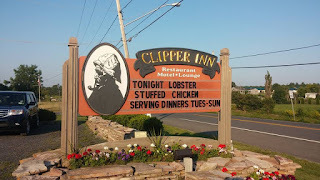 We were seated, on a recent Friday evening, in The Clipper’s back dining room, although the restaurant also has a more formal dining space to the left of the entrance, plus a large, nautically decorated lounge to the right. The room in which we dined was festooned with twinkle lights, with exposed beams and cedar shakes giving the room an indoor/outdoor feel. One of the few rules the Times gives me for reviews is that we have to order off the regular menu rather than from the specials, as readers like to be able to order what they’ve read about when they visit a particular eatery. I’ve got to tell you, that rule was exceedingly hard to follow on this occasion, as The Clipper’s specials the evening we visited included braised lamb and duck breast stuffed with mushroom duxelle. Be still, my hungry heart! No fear, the regular menu features many temptations all on its own. 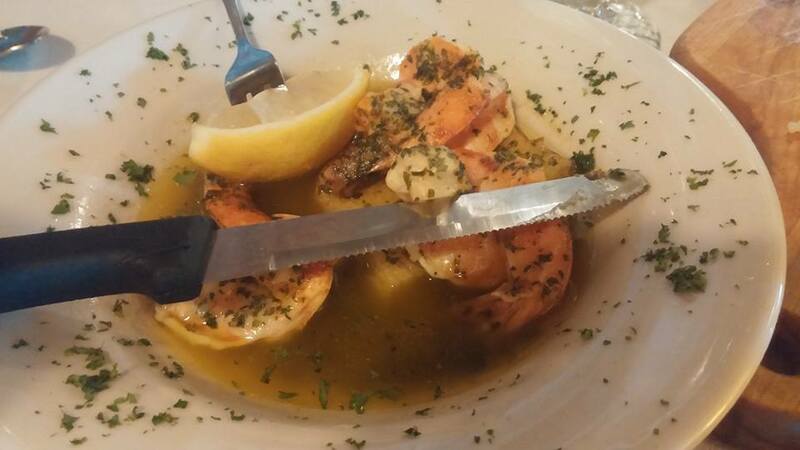 The shrimp scampi ($8.99) was called out in a little box on the appetizers page, so we figured we should try this specialty. The shellfish were expertly seasoned, wonderfully lemony without too much sharpness, with fierce garlic fire brightened up by fresh parsley — the flavors were sparkling and assertive but balanced as well. The bread basket brought to us by soft-spoken, gentlemanly server Ian was chock full of airy, crusty ciabatta. He also brought us oil for dipping and butter for spreading, so this was a versatile freebie as well as being generous. 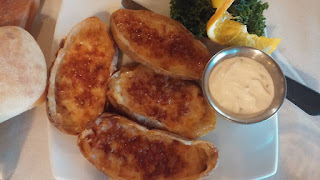 Since the shrimp scampi was so refined a choice, we chose potato skins ($5.99) as our second starter. They were homemade, not a freezer product, with good quality cheddar cheese and bacon. They were ooey gooey, cheesy calorie bombs, not the thin, crispy, tiny things you get in a chain restaurant. Hearty and yummy. The starter salads at The Clipper have always been exceptional, with lots of ingredients and house-made dressings. That hasn’t changed, and while mandarin oranges and kalamata olives together in one dish are not exactly my cup of tea, it’s nice to get a salad with more than just a solitary slice of cucumber and one grape tomato with a mound of iceberg lettuce. The slices of pepperoni, shredded cabbage and mixed greens were a good base for the sharp and pleasantly salty horseradish dressing — I just could have done without the tangy, sweet orange segments. The yellowfin tuna ($24.99) was super flavorful and cooked exactly to order (rare, in this case). The inside of the steak was gorgeously hot pink to contrast with the pale yellow, rich, eggy, herbaceous béarnaise sauce served on the side, which worked with the impeccably fresh fish to create a simple, but beautiful dish. Frogs legs ($18.99) are a unique menu item for the north country and a treat I remember fondly from childhoods spent at our family’s hunting camp, with a creek running through the property. A lot of people crinkle up their noses at the thought of eating this French delicacy, but I love the tender meat. If I had to describe both the flavor and texture, think a very subtle-tasting balance between shrimp scampi and the flat part of a chicken wing. Rice pilaf, one of the side dishes we shared, was buttery but a little boring, for me. We all know I’m a salt junkie, but I would have liked to see some toasted pasta, shallots or herbs running through the rice to kick it up. 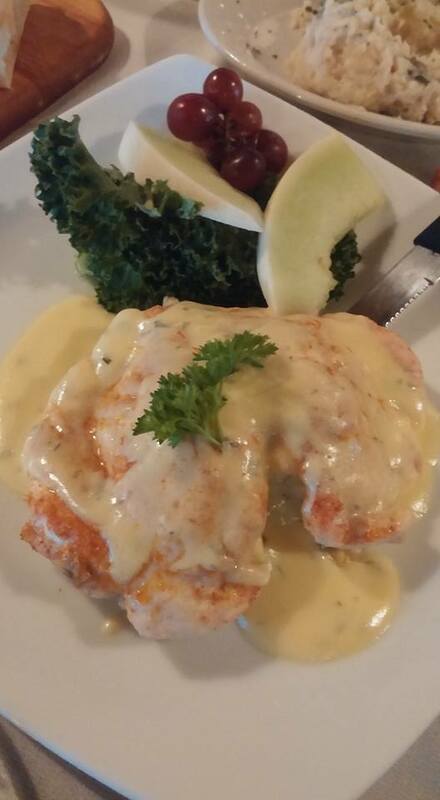 Chicken Alaska ($22.99) was built upon a tender chicken breast, with a smack of lemony tartness and a light, floral saffron flavor. Here’s a bonus: the chicken actually tasted like chicken! Imagine that — how often are we served really bland, tasteless chicken breast? 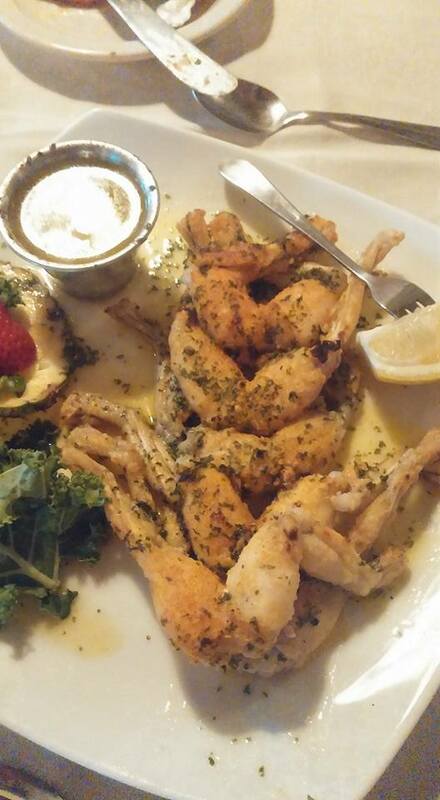 This dish started with great ingredients, and that’s a large part of why the food at The Clipper is successful. 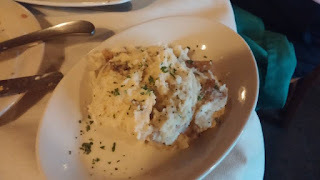 Horseradish mashed potatoes, another side dish, were fantastic: skin-on spuds with lots of personality but not so much of the powerful root as to be hot. They were prepared chunky, with good potato flavor, but still creamy and satisfying like a good mashed potato should be. 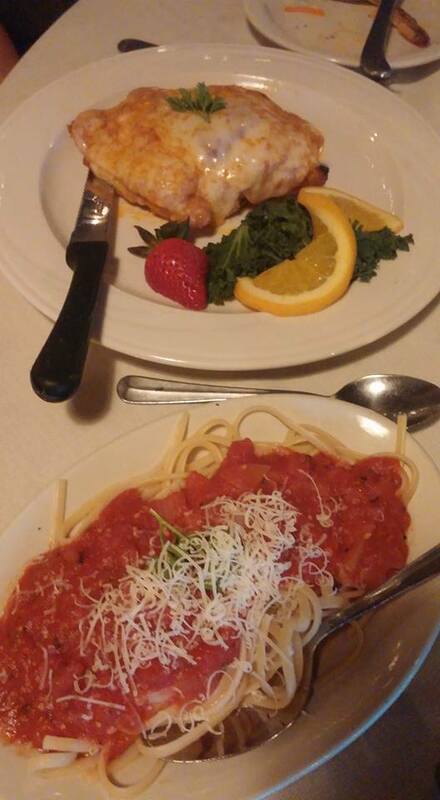 Chicken Parmesan is available in two sizes. Mom ordered the small ($16.99). She's petite, you know? The chef marinated the breast after hand-pounding it, which is a special touch. The finished product was cheesy, but still light. It wasn’t drowning in sauce, and the breading on the fried breast wasn’t a breadcrumb base, but lighter — possibly just egg and flour? It brought me right back to that big date so many years ago — a tasty reminder. Filet mignon ($29.99) was simply presented, with a nice sear on the outside and cooked to order on the inside. 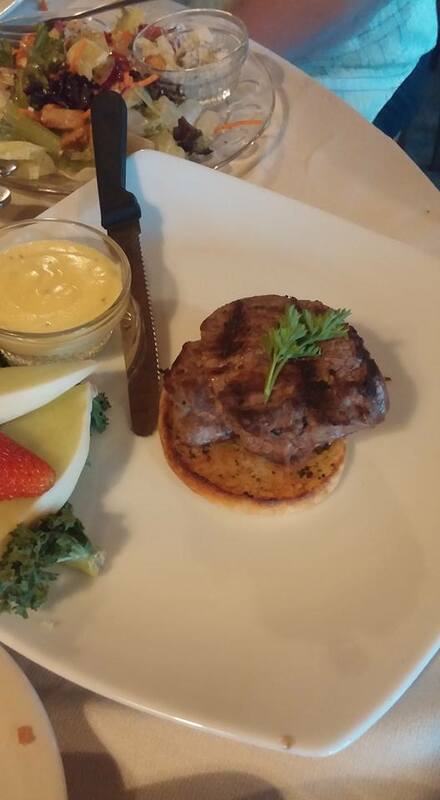 It was well-seasoned, but pretty standard otherwise — a small, well-cooked cut of steak on a plate, no frills. More of that decadent béarnaise sauce was provided in a small cup on the side, in case the diner desired a little frill. Our waitress, Shannon, was attentive, friendly and knowledgeable. The few times we stumped her with our questions, she retreated to the kitchen and reported back with an answer right away. We also appreciated chef and owner Michael Simpson coming out to greet the tables during service and chat about our desserts. Oh yeah, desserts are a must at The Clipper. I told you earlier that the oatmeal cake ($4.99) is what triggered my desire to visit. Well, it triggered groans of pleasure around our table, as well. This moist, deeply flavored, spiced and nutty delight swims in a shallow pool of hazelnut cream sauce that is so delicious, Chef Michael could pour it on the floor and I might just lick it up. I have no shame when it comes to something this delicious. 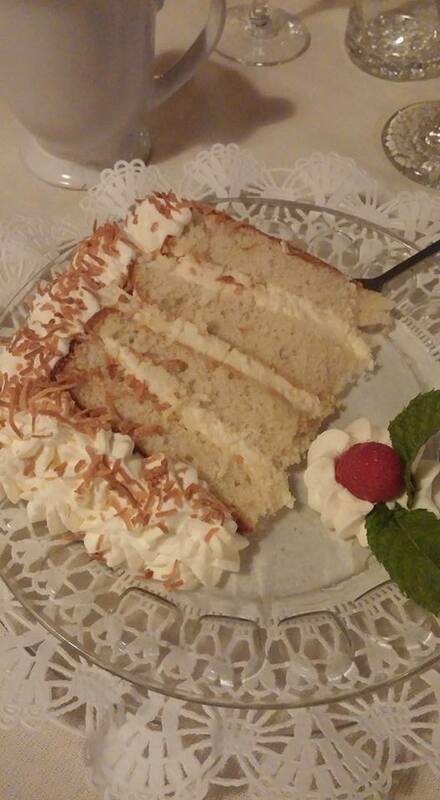 Coconut cream cake ($5.99) wasn’t too sweet, which I appreciated. The toasted coconut sprinkled around the outside lent a nutty, caramelized sweetness to the light cake, and the frosting was made with whipped cream to lighten up the affair even further. The cake itself was so light, it could have been angel food, it was so airy. Baked meringue ($6.99) was what Martha Stewart would call a Pavlova, an egg white mass baked until crunchy, serving as a base for mixed berries. The sweetened, baked egg whites dissolve in your mouth soon after you crunch down into a bite, leaving your palate flooded with a riot of bright, sweet berry flavors. The crème brulee ($4.99) was very sweet, thick and rich — made with a lot of skill, not gritty or eggy like inferior versions. The napoleon ($5.99), a Clipper classic, was very sweet and a little boozy, but the puff pastry in it got soggy very quickly, so the texture wasn’t successful, for me. The total for this feast came to $204.52, with four adult beverages for our party of five. The reason a night out here is worth $200 is that Chef Michael uses high quality ingredients, and then spends the prep time he needs to on some, while staying out of the way of others, presenting them simply and to their best effect. He’s educated enough to know when to enhance what may be a lackluster product, like marinating chicken breast for chicken Parmesan, and when to leave a stunning piece of yellowfin tuna alone, to shine on its own. 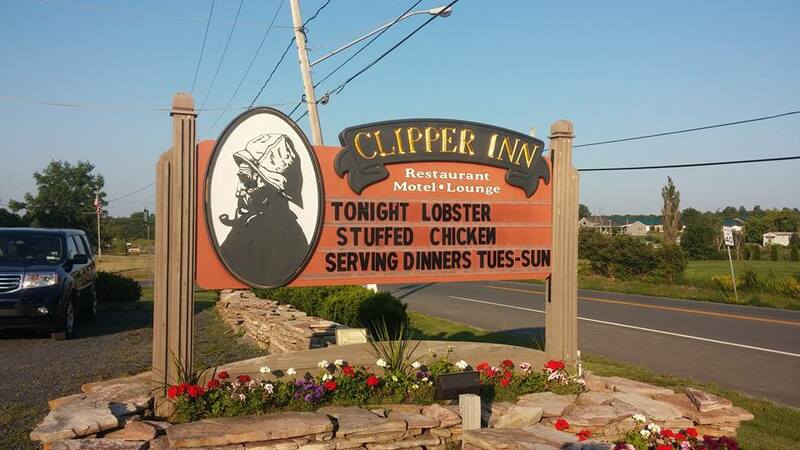 I give The Clipper Inn a nine on the Big Hungry Shelby scale. While not every single dish was a home run, there’s a lot more that is right here than is wrong. The big accomplishment is how long The Clipper’s excellence has been maintained. It’s incredibly hard to achieve consistency, especially in a seasonal restaurant, but The Clipper has been doing it for decades. Attention to detail, a pleasant atmosphere, excellent service and a strong menu with good variety are a testament to robust management and a well-run kitchen. I have heard before that sometimes the staff at The Clipper can be a little bit arrogant, but on this trip, I realized that maybe a slight ego is deserved. I actually think a lot of our local restaurants aspire to what The Clipper has been achieving for ages, and that’s something of which to be proud. If that pride comes off as superciliousness, maybe we can let this one slide. Fresh from the Farm: Tomato Throwdown!